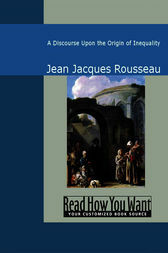 This is a philosophical essay by Rousseau that bears a strong sense of realism. The work captivates with its hard-hitting honesty, vibrancy, and depth. Rousseau is of the opinion that the price of civilization is human freedom and individuality. With civil advancement, mans primeval feelings of self-fulfillment and natural happiness are razed. A true classic!